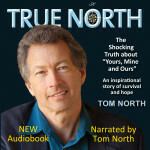 I really encourage listeners to read Tom North’s book – you’re going to learn a lot – not just for yourself but if you have a friend or family or a colleague who is trapped in a dysfunctional relationship, this is an excellent book. Reading Tom’s book and hearing Tom talk about it gives me the faith that we can change children’s lives no matter what they’ve been through as long as we’re willing to hear the story, come forward and do something to help..
Who should read this book? Every parent and step parent, every social worker in state agencies that work with children, every teacher, and anyone who has seen the movie, “Yours, Mine and Ours”. No matter what your motivation is for picking up this book, you won’t want to put it down until you’ve reached the very last pages. Read the NEW Free Excerpt! Tom North is an Official Supporter of National CASA for Children whose volunteers provide a net of support and bring a positive change to the lives of abused and neglected kids. In the 45 years since the movie, Yours, Mine and Ours starring Lucille Ball and Henry Fonda became the 4th highest grossing film of 1968, it has not been unusual for me or one of my siblings to be asked what it was like to be part of “that big wonderful family”. Having seen the film many times, I must agree that what became known among my brothers and sisters as “the big lie” was actually a very charming film and a well-told story. Would that it had been true! 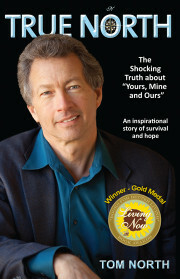 During and after the family healing sessions (True North – The Shocking Truth about “Yours, Mine and Ours”, Chapter 26), it was agreed by many of my family members to never again support the lie promoted by the film. I personally resolved to tell the truth as I knew it, about my experience in the “Yours, Mine and Ours” Beardsley household. As you’ll read in my blog, my own healing as a child abuse survivor is an ongoing process, and I find everyday occurrences can set off a chain reaction of feelings that are looking for expression and release. I also understand that I must go through the process to see the truth of the beauty on the other side. My mission is to reach out to people who feel isolated, or misunderstood in the world and help them understand that they are not alone, and that their feelings may well-be related to experiences they had in their early lives where they felt victimized by those who had greater power than they did. Those experiences may have caused great pain. I want people to understand that the more they experience their own divinity and essential nature, the more they will actually relate to humanity and see the beauty in themselves and the world. Thank you for being part of this outreach by sharing the message of True North – The Shocking Truth about “Yours, Mine and Ours”. I wish you happiness and fulfillment in life.